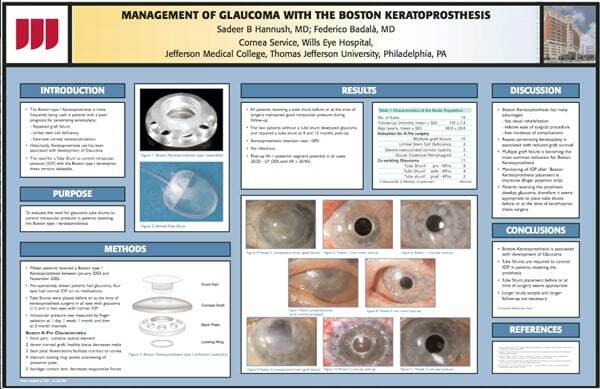 Management of Glaucoma with Boston’s Keratoprosthesis. Congress: The Association for Research in Vision and Ophthalmology (ARVO). The Boston’s Keratoprosthesis is the more succesfull artificial cornea avaible today. It is used when the cornea’s transplant is controindicated. Often the patients with Boston’s Keratoprosthesis have the glaucoma or are able to develop it. Curing the glaucoma can be difficult in that cases. Dr. Badalà showed at this congress his wide experience on the glaucoma’s cure with the Boston’s Keratoprosthesis.